Unburnable, indoor/outdoor. Kite is produced with an innovative process without tooling costs folded from an Aluminium-Platin in 3 mm material thickness. This gives Kite extreme lightness and a compelling graphic structure, as well as inviting form of seat-shell. Unburnable, indoor/outdoor. Weather resistant powder-coating allows use indoor and outdoor, for example also nicely for patio or public gastronomy. Variating base-frames complete interior furnishing and multiple seating in public areas. Kite is available 4-legged in oak nature and stained olive color, legs mounted on anodized black matte frame giving the seat-shell a pending look. For public and outdoor use finishing is offered with stackable skid-frame anodized black matte and chrome. Standard colors of seat-shell are white and anthracite. Special color-concept is mustard, warm-red, arcticblue and taupe. taupe empfehlen wir die Ausführung Eiche hell. For light colored seat-shells white, arcticblue and taupe we recommend oak nature. Mustard, warm-red and anthracite are complimented with more contrast given with olive color. 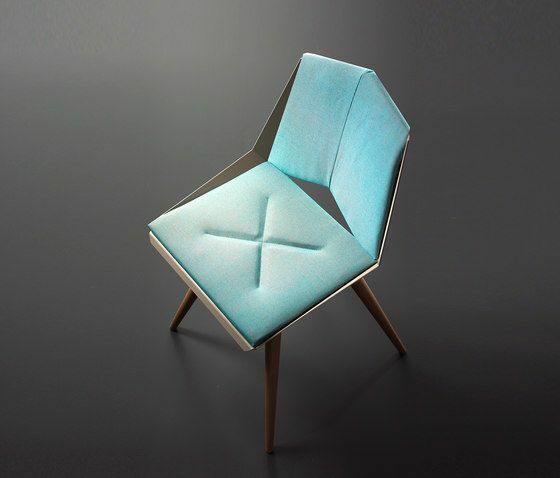 Upholstery is developed underlining the graphic structure of the seat-shell. Seat- and back- cushion are removable and can be exchanged easily with clip-on system. Kite also is offered with seatrest in 8mm felt. Kite is enrolled as petty patent and in pat.pend.